E is for … ? He has lots and lots of frown lines! Oh my goodness, he is the King of the Frown. 🙂 Which made him fun (and fairly easy) to draw. Seriously, try it! It is so much fun to draw people. Especially if you go into it saying “Here goes nothing.” What have you got to lose? Tomorrow, I’m taking a little break from portraits for some watercolor fun. I’m thinking of it as a little March Dance to Make Spring Come FASTER. hehe. We’ll see if it works! Time to get those art supplies un-squirreled away and play! That’s what Sundays are for. See you tomorrow. < D is for … ? No one’s guessed this yet? Well I don’t want to steal two first guesses in a row. I think both sketches capture him excellently though and the colour on the new one definitely works really well. I’m going to have to give portraits a proper shot at some point. No guesses at all, and thanks for your comment!! I can’t wait til you try portraits. I think the key is selecting an easy face, like this one, with such distinctive features. I still have a long way to go, obviously, but even if you make lots of errors, as I did in this, the face is distinctive enough that people will probably still guess it. So it’s a nice ego boost for you, and keeps you rolling on to the next one. As you say, it’s all about practice, so whatever keeps you rolling is key. I’ll keep that in mind. Thanks for the advise. I’ll try to pick really distinctive faces at least for my first couple of portrait attempts. Your portraits are excellent and I’m enjoying the guessing game too :). Thank you so much, and I’m glad you’re enjoying it! It helps me to keep things light, because I’m inclined to judge myself too harshly, or be disappointed if the drawing isn’t exactly like the photo. Which is silly! Having fun with it and seeing people get a kick out of guessing really helps me to relax with myself and just let be, post mistakes, and just keep going. That’s great. The important thing is to just keep having fun with it and not stress out about getting things perfect. It seems like you’ve found an awesome way to do that. We’re all our own worst critics. I really loved this one! great job on getting the mood down. I also really like the CP version, because it gives some warm light to it somehow. And, well, he was better looking that age. 😉 But the other one is nice too. He really is the king of frown, and you really got that! Thank you!! I prefer the CP also. The color is good for his face, I think. 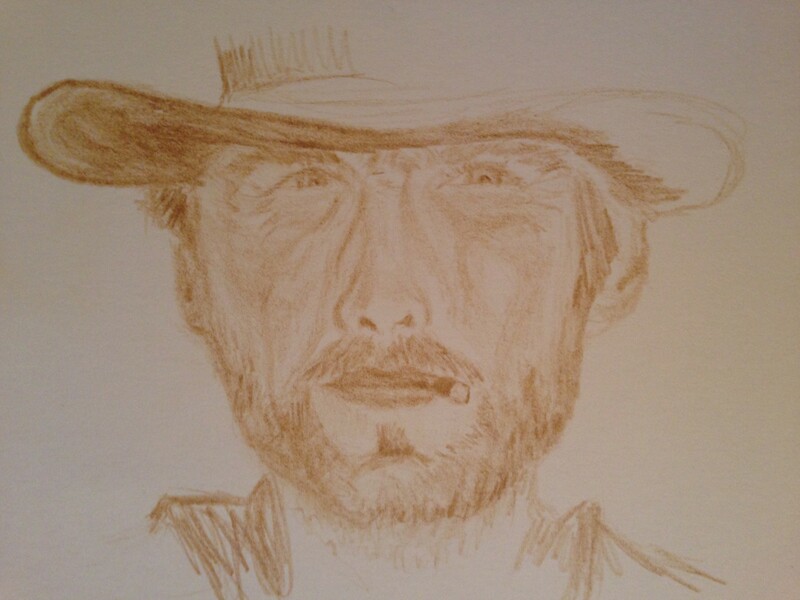 Clint Eastwood. Of course. His face is great. Make me want to draw him too. Nice job. Thank you! You should try him. Faces like his are great. Another Extradordinary (E word) job! Clint Eastwood of course! Thank you, Jodi! I really enjoy drawing him. He makes my job easy. I hope Clint Eastwood sees your fine portrait of himself. I am sure he would be pleased. Thank you so much! I of course see all the flaws, but how nice of you to comment. 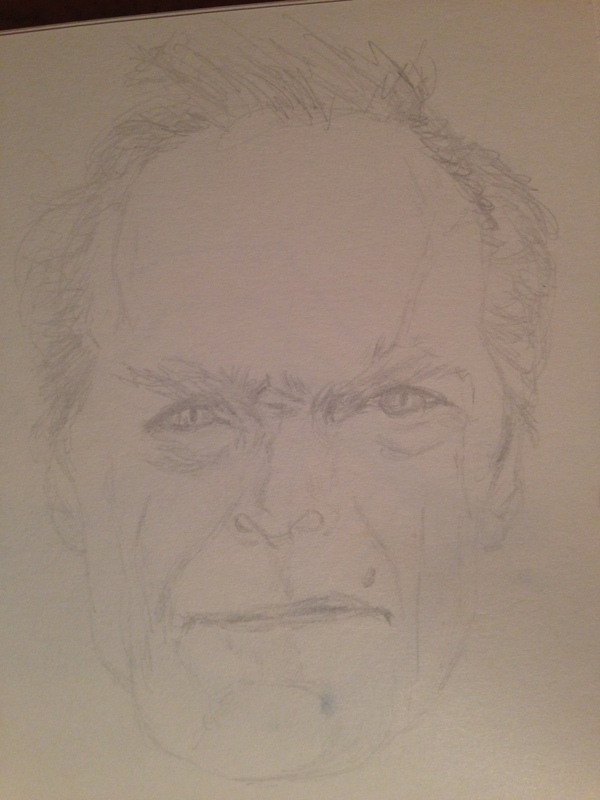 My husband and I both figured it was Clint Eastwood. Nicely done. One of my father’s favorite actors.